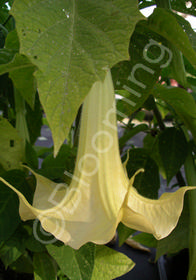 Large, pendulous, orange-yellow flowers have strong recurved petals and are slightly fragrant. The bold tropical foliage is stunning! An exceptionally vigorous cultivar named after the late landscape designer, Charles Grimaldi.